The library is very small - just a single function with a few lines of code. I wanted to check how fast it was, and if it could be made faster. Here are the steps that sped it up by a factor of 5x, and in a particular use case by a factor of 50x (using caching). I grabbed the original source code and pasted into index.html. To test it, I am computing 1 million random numbers in the range from 1 to 1000, then calling nth on each number. The initial function takes almost 1 second to process 1 million numbers. 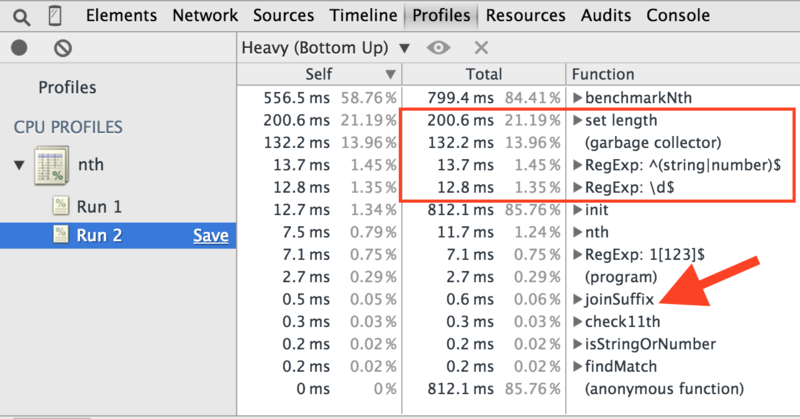 Chrome profiler does not show which statements are bottlenecks - it works at the function level. Thus I need to refactor the code to find the actual bottleneck. This is the same logic as the original function, but now Chrome profiler can show which parts take longer. Hmm, all bottlenecks are native functions (red rectangle). None of my little functions are taking too long. 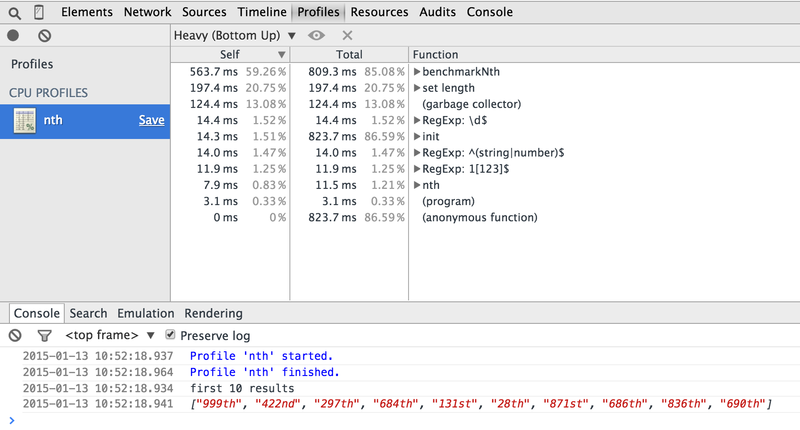 Chrome profiler does not show any obvious bottlenecks in this code. I wanted to see if any of my functions has not been optimized by the v8 engine. I showed how to check function's status in Detecting function optimizations in V8. I copied the nth source code into index.js and used v8-natives module to profile and query function's optimization status. Every function has been optimized, so nothing is obviously slow. Where is the bottleneck? I went back to the Chrome profile results. Where is the call set length coming from? We do not get length of a string or an Array anywhere in our code. I also wanted to know why the garbage collector runs so often. Seems we are creating a lot of objects somewhere. Inspecting the tree view in the profile, I noticed that set length seems to be called from joinSuffix function. While we can profile and improve each individual function, this application has its specific obvious optimization to make. We are computing suffix for 1 million numbers limited to 1000 range. Thus we can cache the computed results once and avoid the multiple computation.